With more than a century of business in the insurance field, Amica is the oldest mutual insurer of automobiles in the country. The company also offers home, marine, personal umbrella liability and life insurance products. Amica prides itself on exceptional customer service. In fact, J.D. Power and Associates has ranked Amica the highest in customer satisfaction among national auto insurers for 12 years in a row. connections, appraisers weren’t always able to upload information while out on the road. So they often had to spend two or three hours each night “babysitting” their laptops, to make sure all the estimates from the day were uploaded properly. In addition, standard business laptops often broke down in the field. Amica employees regularly experienced hard disk failures in large part due to factors such as vehicle vibration, as the laptops were not designed for use on the road. In addition, Amica was motivated to move away from a pen and paper process to improve communication and efficiencies with auto appraisers, which would in turn get money to customers faster. In 2007, the claims department decided to equip its auto appraisers with offices similar to those used by police officers—with vehicle-mounted laptops. With a wireless connection, appraisers could write estimates at the site after appraising a vehicle and initiate the upload of the report, which would complete while they were driving to the next customer’s location. Since Amica had experienced numerous failures with regular business laptops, the claims department only considered ruggedized notebook computers. Amica knew the mobile computers would need to be fully functional in and out of the vehicle. In addition, driver safety was a big concern in the instance of a collision with a vehicle-mounted laptop. Amica identified Panasonic early on as a leader in the rugged notebook space and knew its partners were experienced with vehicle mounting. 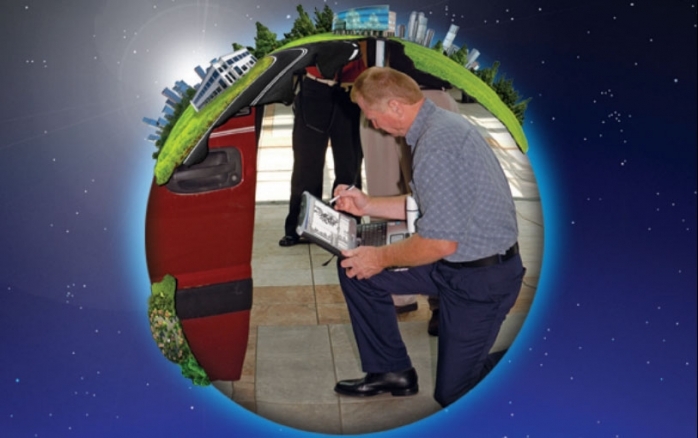 Toughbook® computers also had a reputation for a low failure rate, which was a strong selling point for Amica. The insurer also valued Panasonic’s commitment to its customers and its platform stability. Since Amica was making a significant investment in vehicle mounts, it also wanted to ensure the laptops would remain compatible with the mounts even with product upgrades over time. Panasonic was also willing to work directly with Amica and its partners to provide a safe and effective solution. After its experience with business laptops, Amica understood the value of conducting a pilot program to ensure the device would work well in the field and be embraced by its appraisers. Amica selected the Toughbook 18 convertible tablet because of its rugged specifications as well as its ability to be used in standard mode in the vehicle and as a tablet with the customer. For its initial pilot, Amica selected one technical appraiser and one non-technical appraiser. After receiving good feedback from the field, Amica moved forward with a second pilot with 10 appraisers using them for six months. During these pilots, the claims department was able to proactively gather a lot of information about likely situations appraisers would experience in the field and develop ways to address them. After a successful, extensive pilot, Amica felt confident the Toughbook 18 was the right device.